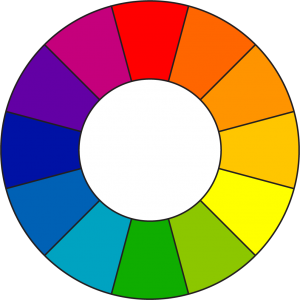 A color wheel, or circle, is a diagram used to show the organization of the hues of various colors. It is also used to map out color schemes. Generally the wheel is divided into 12 color segments and uses an RYB color model.The 3 primary colors are 120 degrees apart. Halfway in between the primaries are secondary colors which are formed by mixing two primaries. Between each primary and its neighboring secondary is a tertiary color. In the color wheel to the right; red, yellow, and blue are the primaries. Orange is a secondary mixed from red and yellow and is halfway between red and yellow. Red-Orange is a tertiary color and is halfway between red and orange. WikiPedia has a very detailed post on the color wheel with possibly more information than you'd want to know.